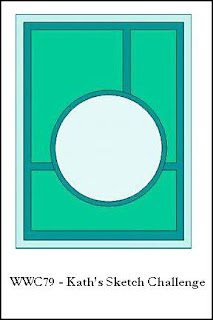 Kath Ricks is hosting our challenge this week at Watercooler Wednesday Challenges. She has chosen a great sketch for us to use. My card turned out to be rather bold and bright. I love the look of the Copper Embossing Powder on the Night of Navy cardstock. Layering it on top of the Flirty Flamingo really made the combination pop. Stamp Sets: Love You Lots (sentiment), Timeless Textures, Sitting Here; Inks: Cajun Craze, Jet Black StazOn, VersaMark; Stampin' Write Markers: Flirty Flamingo, Old Olive, Peekaboo Peach, Sweet Sugarplum; Cardstock: Flirty Flamingo, Night of Navy, Whisper White; Other: Postage Stamp Stacklets (Taylored Expressions), Copper Embossing Powder, Blender Pen, Dimensionals, Big Shot Die-Cutting Machine. All Stampin' Up! product unless otherwise noted. I'm loving the copper embossing powder! Thanks, Kath! The Copper Embossing Powder has turned out to be my favorite with Silver as my next choice. 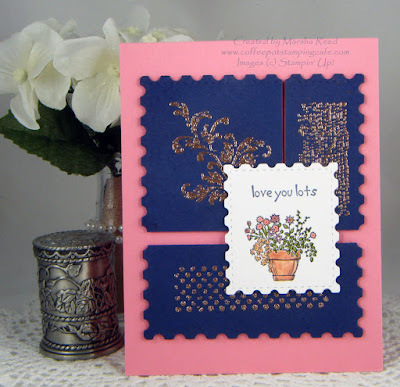 What a great mixture of stamp sets and colour you've used on this card Marsha. I really like the Night of Navy and Copper combination, and I like the way your rectangle is cut with the Postage Stamp Stacklets. Thanks for sharing. Thanks, Penny! I love those stitched stacklets.